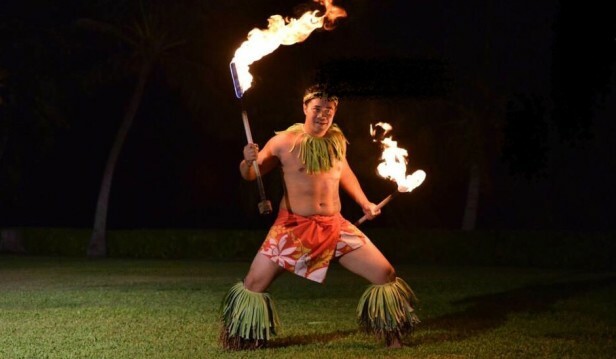 Experience the excitement of Modern Fire Knife dance! Fire Knife is a traditional Samoan cultural implement that is used in ceremonial dances. It was originally composed of a machete wrapped in towels on both ends with a portion of the blade exposed in the middle. Tribal performers of fire knife dancing (or Siva Afi as it is called in Samoa) dance while twirling the knife and doing other acrobatic stunts. The towels are set afire during the dances thus explaining the name. Enjoy the thrill of this exciting dance! Picture above of the Samoan Fire Knife Dancer is from one of our Paradise Cove private events. Video is from a private event in Honolulu, Hawaii.